In 1872, she married John Fee. I have yet to find a record confirming that fact. For the longest time I couldn’t find the Fees in the 1881 Canadian census. Recently, I discovered that was because they were living in Plattsburgh, NY, and were recorded in the 1880 US census. John (34) was a machinist, while Henrietta (33) was keeping house. Daughter Mildred (6) was at school and son John was 2. In the 1891 census, Henrietta (42) is married to John Fee (44), a machinist, and they are living back in Montreal. They are Methodist. Their children include Mildred (16), John (13), William (10) and Ruth (6). William and Ruth are shown as being born in the United States. I have yet to find the family in the 1901 census but in 1911, they are living at 377 Grosvenor in Montreal. John (66) is a machinist and still married to Henrietta (65). Their sons John (33), also a machinist, and William (30) are still at home as is daughter Ruth (26). Their other daughter, Mildred (36), is also at home but is now listed as Mildred Newmark. Her children are also living with the family: Basil (16), Henry (14) and Grace (8). Henrietta Salter, ?? of the late John Fee, in her eighty-sixth year, died in the City of Westmount, Province of Quebec, on the twenty-second of January in the year ninetten hundred and thirty-two and was buried in Mount Royal Cemetery on the twenty-fifth day of the same month and year. 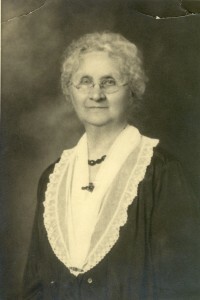 Henrietta on her 80th birthday in 1925.